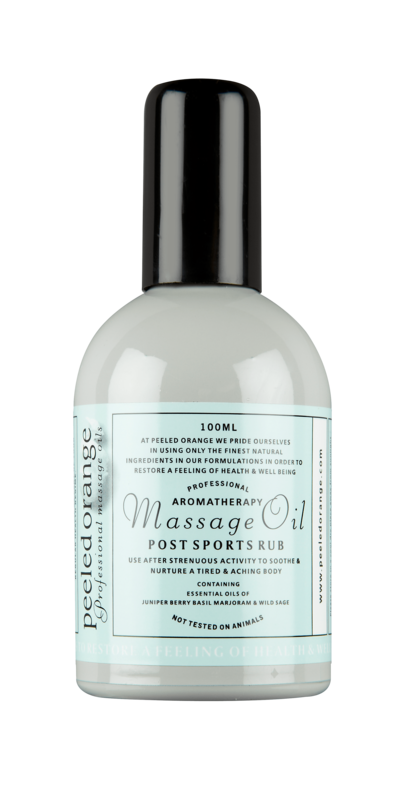 Peeled Orange Post Sport massage oil is a deeply warming muscular body rub for use following the rigors of sport activity. Containing essential oils of Juniper Berry, Basil, Marjoram, and Wild sage, this expertly blended formula has been specially devised to assist athletes following strenuous exercise in order to nurture and soothe that aching body or to be used for a sport injury massage. Just read the properties of each of our carefully selected sport injury massage oils below! Pure essential oil of Juniper Berry has the ability to help tired muscles unwind. This soothing, warming oil is an all time favorite within the realms of Aromatherapy and its ability to maintain muscle tone makes it a natural choice. Aromatherapists use Basil to strengthen and revive the body following exercise. The warming, restorative properties of this wonderful herb are an ideal ingredient to assist in any programme of sporting action and leisure pursuits. Naturally, our bodies experience a certain level of stress and strain whilst taking part in sporting activity. Essential oil of Marjoram is highly regarded by therapists and is extremely effective when used following rigorous exercise, particularly for overworked muscles. Essential oil of Sage is a powerful and rigorous oil with a sharp, piercing aroma, which will warm and ease fatigued muscles. It is an ideal oil for when you have been pushing yourself hard and need the deep reviving powers of this wonderful herb.